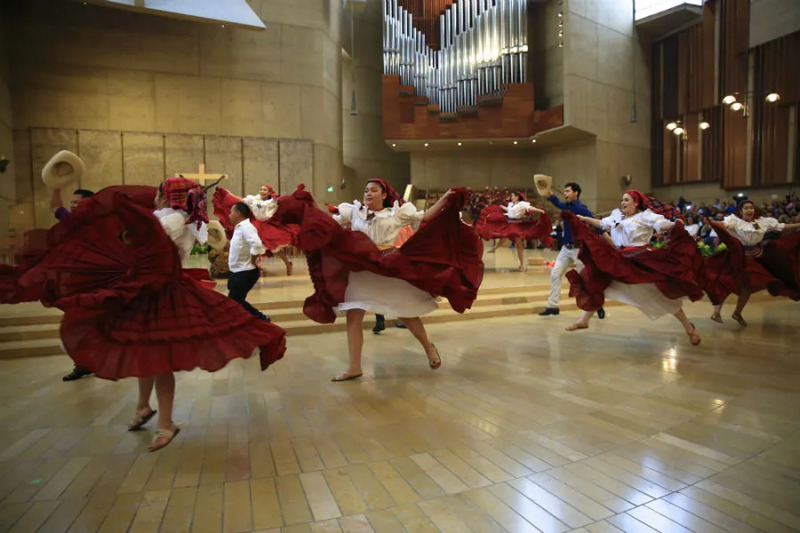 Los Angeles, Calif., Oct 15, 2018 / 05:00 pm (CNA).- Thousands of Catholics in the Archdiocese of Los Angeles gathered in the cathedral on Sunday to celebrate as Oscar Romero was canonized in Rome. St. Oscar Romero was canonized by Pope Francis Oct. 14, together with six other new saints. That same day, an estimated 3,000 people gathered at the Cathedral of Our Lady of the Angels in Los Angeles for a Mass and celebrations. Romero, who was the archbishop of San Salvador in the late 1970s, had been a major voice in defense of human rights for the Salvadorian people, especially during the early stages of the country’s civil war. Before the liturgy Sunday, Salvadorians performed traditional dancing, while clips of Romero’s recorded homilies and speeches could be heard over the loudspeakers. The inside the Cathedral was decorated with images and photographs of the newly minted saint, including a picture of Romero during one of his famous radio broadcasts and an image of the 250,000 mourners who attended his funeral at San Salvador’s Metropolitan Cathedral. The Mass was celebrated, in Spanish, by Auxiliary Bishop Alexander Salazar. The homily was given by Deacon Ricardo Villacorta, a Salvadorian immigrant who left the country during its civil war. Saint Oscar Romero was shot while celebrating Mass in March, 1980, during the country’s escalating civil war. Romero was an outspoken critic of political injustice in the country and of the violence affecting the lives of ordinary Salvadorians. In a homily the day before he was martyred, Romero admonished soldiers to follow God’s law over the orders of their superiors. “This was a very brave act: He told soldiers they have to act from their morals, and not just follow directions from their superiors,” said Rich Villacorta, son of Deacon Villacorta and an archdiocesan employee, according to the Los Angeles Times.